You’ve heard of one pot recipes. 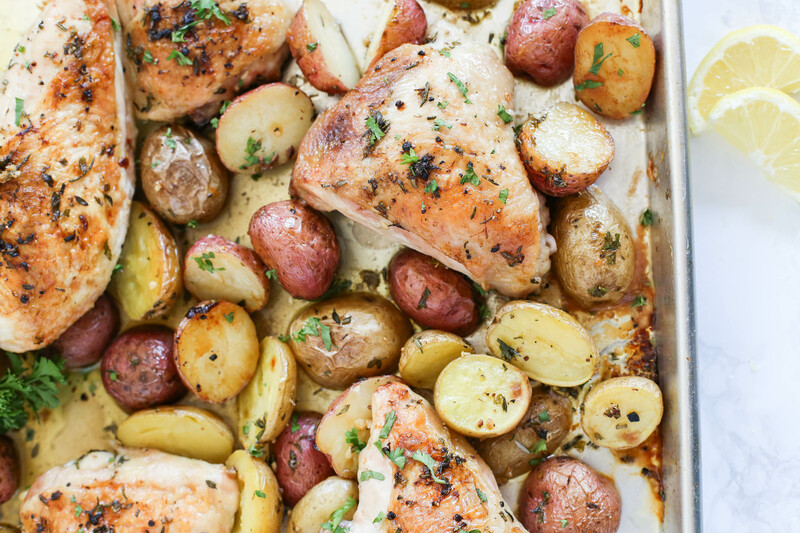 Well, this recipe for herb-roasted chicken and potatoes is a whole meal made in one pan. It’s simple to prepare yet elegant, which makes it as equally convenient for a weeknight meal as for a special occasion. 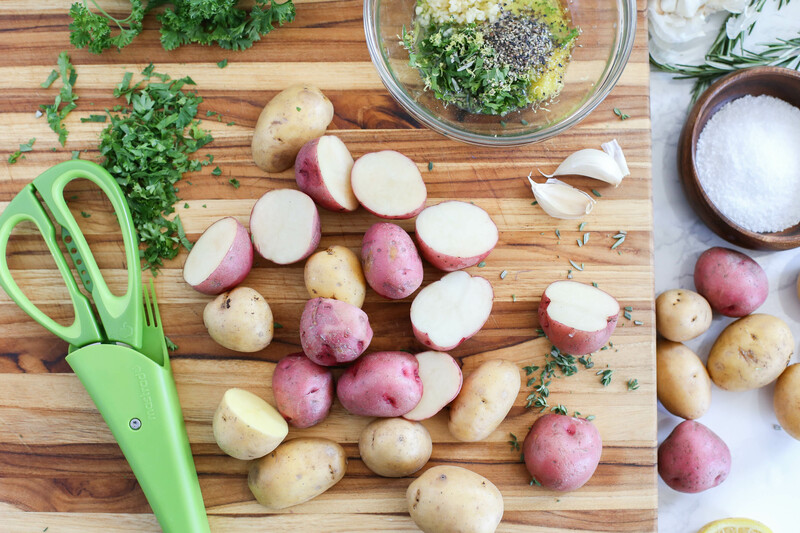 The bright flavors of lemon and garlic are mixed with a heap of fresh herbs including thyme, rosemary, and parsley. 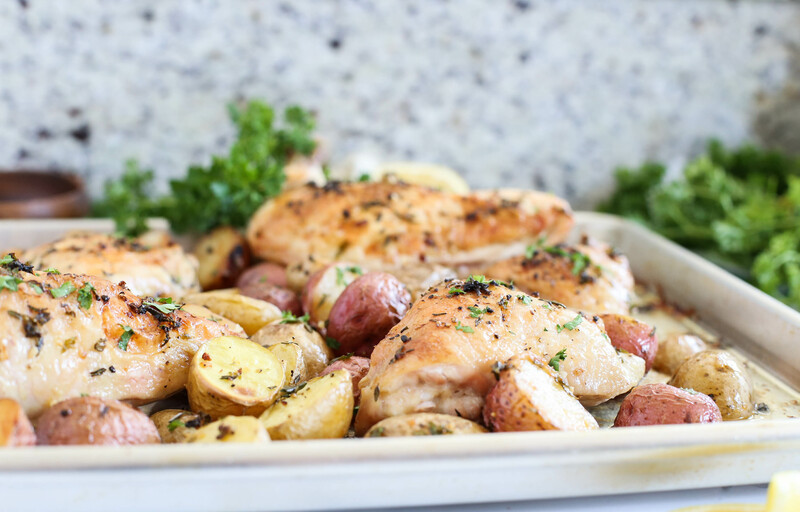 Your whole family can enjoy a dinner that is easy to put together and healthy, featuring tender, juicy chicken and roasted potatoes. I love the combination of thyme and rosemary, mainly inspired by the french fries at Good Stuff Eatery here in DC (which I could eat every damn day). I also include fresh parsley in this recipe to tie in with the lemon and garlic flavors. That’s a whole lotta fresh herbs for one recipe. 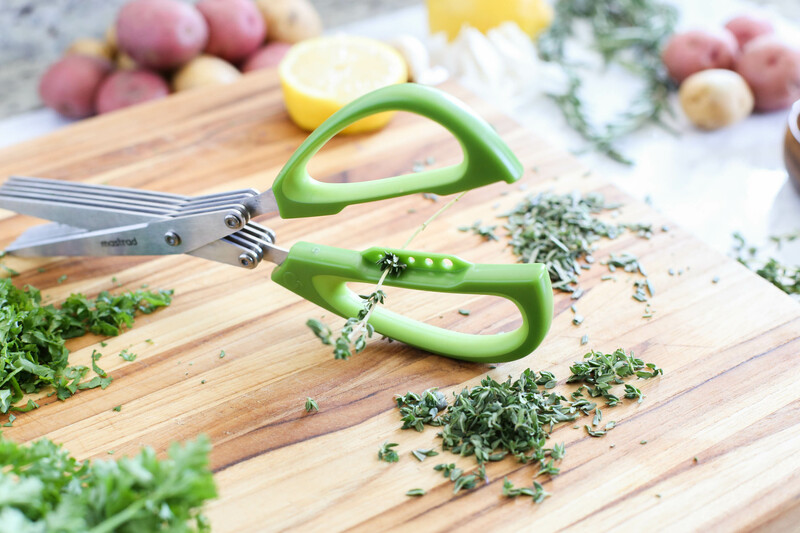 But you can make quick work of any fresh herbs with some handy herb scissors. If you’ve never seen scissors like these, I suggest heading over to Mastrad’s website to check them out. 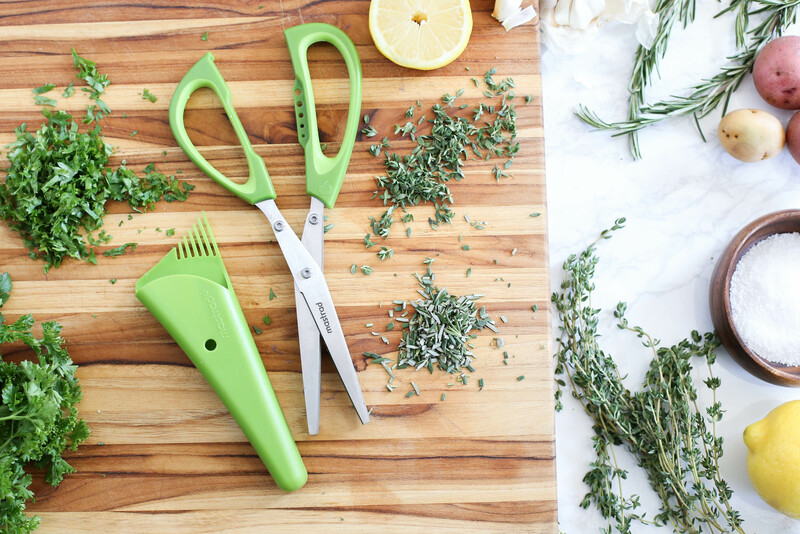 There are several things I like about these herb scissors (including the fact that they are only $12). They have five blades, so they save time when it comes to chopping. You can make extremely quick work of parsley, chives, rosemary, dill, and basil. Seriously, the more that I use them, the more that I like them. The scissors also come with a magnetic holder that can go right on the refrigerator, so it’s not another gadget taking up space in the junk drawer. Perhaps my favorite feature though is the herb stripper. I’ve avoided fresh thyme in the past because I find it painstakingly slow to remove each leaf from stem. Perhaps it’s a patience problem. But the herb stripper actually works; you pull the stem through and the thyme falls off. I am trying my hardest not to make a pun about it being a major thyme saver. Oops there ya go. 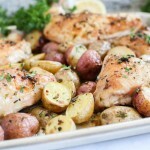 When I was looking at weeknight chicken recipes, I came across a lot of whole roasted chickens. I decided not to go whole chicken on you, because I feel like that is another post for another time and another place. Like an entire tutorial. This recipe is easy to approach for beginner cooks. There is a difference in the chicken you buy though. I definitely suggest getting skin-on pieces, whether you prefer chicken breasts or thighs (or use a mix, such as I did). Feel to use all chicken breasts or all chicken thighs. Using bone-in chicken will also give you the most tender results. If you use boneless, the cooking time might not take as long. Just keep that skin on, because it keeps the chicken moist while it bakes. (Can I admit that I don’t even eat the skin after its done cooking?) For extra crispy skin, place the baking sheet under the broiler for a couple of minutes right before serving. The whole point of this recipe is to throw everything together in the oven and be done. IF you’re feeling ambitious there are a couple of additional options: you can serve the chicken with a side salad if you really want, because health and all that. You can add more vegetables to the pan, but keep in mind that each vegetable has a different cooking time. I love the convenience of having a side dish of potatoes cooked and ready right at the same time as the main attraction. In the same pan no less, making for extremely easy clean-up! Preheat the oven to 400° F. Lightly coat a baking sheet with nonstick spray. Place the potatoes in a single layer on the baking sheet and toss with one tablespoon of olive oil. Sprinkle with salt and pepper. In a small bowl, whisk together the remaining two tablespoons of olive oil, lemon juice, lemon zest, garlic, 2 teaspoons of salt, and one teaspoon of pepper. Set aside. Pat the chicken dry and place on the baking sheet with the potatoes, with the skin side up. Brush the lemon garlic mixture over the top of the chicken and sprinkle the entire pan with fresh parsley, thyme, and rosemary. 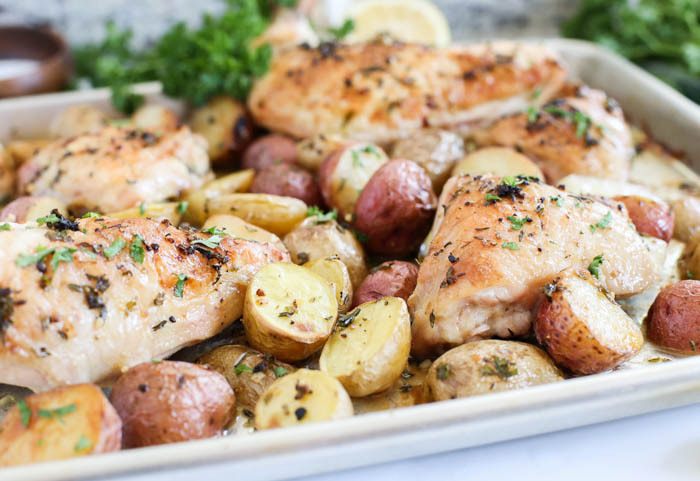 Roast in the oven for 35-45 minutes until the chicken is cooked through, or until a thermometer reads 165° F. If desired, place the baking sheet under the broiler for a few minutes to make the skin more crispy. Remove the chicken from the oven and cover loosely with foil. Let rest for 5 minutes before serving. Top with additional fresh parsley if desired. Serve with a lemon wedge. Any combination of chicken breasts and thighs can be used. Bone-in, and especially skin-on will yield a more tender result. The cooking time may vary if using boneless breasts or thighs. Haha, now you have me wishing for a dish fairy. Hope you guys enjoy the recipe!